If you have ever had allergies, you know how miserable they can make you. This is particularly true when they cause an itchy, irritating rash. Just like humans, dogs can develop allergies and eczema. Dog eczema is a persistent health issue, but with a bit of patience and attentive vet care, you can get your dog's itching under control. 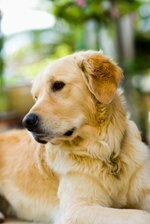 PetMD states that dogs who get eczema often have a history of dog skin allergies. Allergens like animal dander, pollen, mold, and even dust mites can cause an allergic response in dogs. These skin allergies lead to itching and irritated skin and may be more noticeable during certain seasons. According to Wag!, eczema can present with different symptoms depending on how severe it is. A mild case of eczema can cause your dog to be extra itchy, and you may see him licking or scratching at himself more often in an attempt to relieve the skin irritation. Dogs with severe cases of eczema will develop hot spots, which are hairless patches in your dog's coat. Hot spots are areas that are highly irritated, and eventually they will become open, weeping sores. In order to appropriately treat your dog's eczema, you will need to schedule a vet appointment to determine just what is causing your dog's skin condition. PetMD states that during the appointment, your vet will take a complete medical history on your dog and will perform a physical examination. Your vet will probably perform allergy testing. There are a few different types of allergy testing available, but their accuracy differs. Your vet may use intradermal testing that may help you to determine what is prompting your dog's allergic reaction. With intradermal testing, your vet will inject small amounts of allergens under your dog's skin. If a red bump develops in response, your vet will measure it to determine which allergens are troubling your dog. Your dog's treatment will need to be tailored to address the specific allergen that is causing the issue. According to PetMD, your vet may determine that hyposensitization therapy is the best treatment. With hyposensitization therapy, your vet will give your dog injections of the allergens that were causing the reaction. This canine eczema treatment is largely effective in reducing itchiness in dogs, but it can take between six months and a year before it starts to work. Additionally, your vet may prescribe medications to help control your dog's itching. Corticosteroids and antihistamines are popular and effective options. Topical sprays can also help to relieve your dog's itching. Treating eczema in dogs can be a difficult process. PetMD states that eczema rarely goes into remission or resolves on its own. Plan to schedule checkups with your vet every two to eight weeks. During these appointments, your vet will monitor the effectiveness of the treatment and will possibly make adjustments. Once your dog's itching is brought under control, your vet will probably adjust the appointment schedule to see your dog just once every three to 12 months. While your dog's eczema flares up, you can bathe her in cool water and use an anti-itch shampoo to help give her some relief. If your dog tests positive for certain allergens, your vet can advise you on how to avoid them.